This week on Freaky Friday news, we have feature women who make a difference in their world. It's not feminism per say; just good old fashioned human nature at work here. A few weeks ago, 23-year-old Pradnya Mandhare waited for a bus after a morning of lectures and studying. A drunk man started to grab at her while a crowd of people ignored him. Pradnya tried to move, but the man followed her. Determining that she was on her own, Pradnya hit the man over the head with her bag. He attempted to retaliate, but was too drunk to actually hit her. But the drunk man didn't stop his groping. So Pradnya grabbed her assailant by his hair and dragged him to the nearest police station. When I first read this story, this is the point where I did a happy dance. It takes time for a society and its attendant culture to change enough for a woman to feel empowered to handle her own safety. And clearly Indian society is changing such that Pradnya felt comfortable bringing the man to the police. Well, figuratively comfortable, since dragging a smelly, drunk man by his hair sounds uncomfortable in the literal sense. So here's to Pradnya - may your life be less interesting! As for the people who watched what happened and did nothing - shame on you. Maybe next time, you'll find the courage to do what is right. When the citizens of Raigarh, an industrial city and "Cultural Capital of Chhattisgarh", voted this year for mayor, they skipped the candidate from prime minister Narendra Modi’s Bharatiya Janata party (BJP). 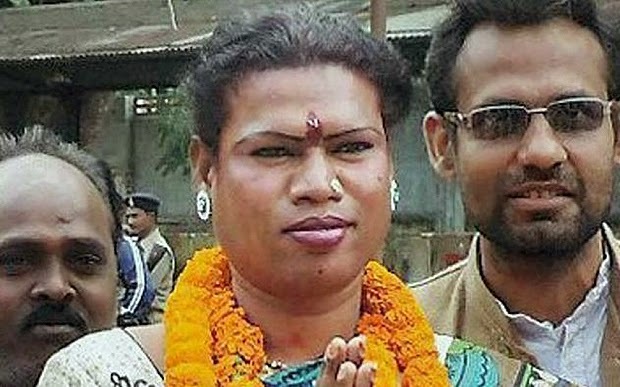 Instead, they voted in independent candidate Mandu Bai Kinnar, a former member of the Untouchable caste and transgender woman. I'm not certain what's more surprising, that a transgender person was elected, or a member of the Untouchables was elected. Both seem to be long odds, but experts predict that Ms. Kinnar will be mayor for as long as she chooses.